Alley Behind DC Reynolds, Looking Glass Lounge Renovated | Park View, D.C.
Re-bricked alley viewed south from Princeton Place. I’m very happy to see the alley between the 3600 blocks of Georgia and New Hampshire avenues has been renovated — and with new brick like the original alley. 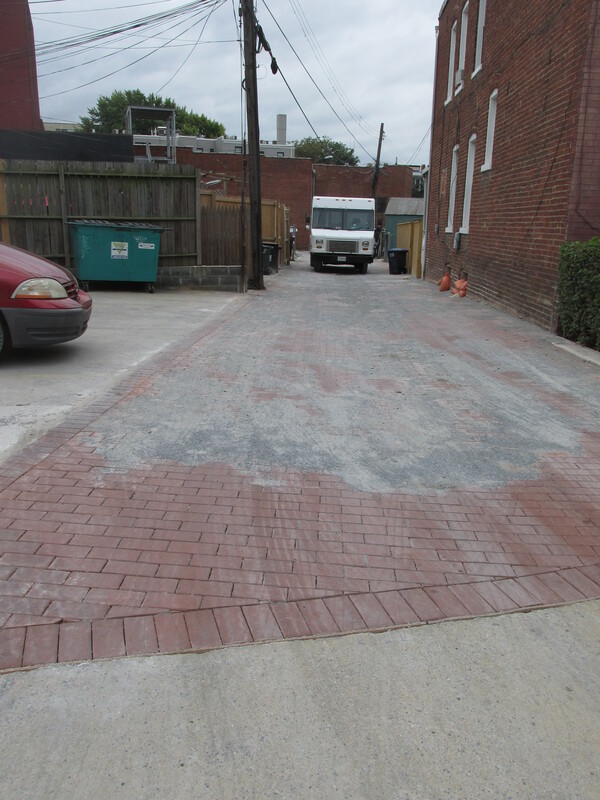 Over the past several years we’ve seen an increasing number of alleys redone in the neighborhood. Considering the poor state of many alleys in Ward 1, overall we’ve been doing really good in Park View. This entry was posted on September 25, 2014 at 7:01 am and is filed under alleys, DDOT. You can subscribe via RSS 2.0 feed to this post's comments. Is there a process for requesting this to be done? The alley between the 700 block of Park and Newton should probably be torn up, leveled, and rebricked. Same for the alley between the 600 block of Princeton Pl and Otis Pl. How is do we get in this queue? what is a looking glass??? DC Reynolds FTW! !